We’ve never met before, but I have a pretty good hunch about why you’re here. You have this nagging desire in the pit of your stomach and you can’t shake it. You know you were created for more and you want more out of life. You want to do more, accomplish more, and unleash the fearless, courageous, and fiercest version of yourself. The problem is you’re feeling stuck. You’ve thought about it obsessively, but for some reason, you’re not making any real headway. Does this sound like you? If so, then keep reading. I’m willing to bet that if you look a little deeper and are painfully honest with yourself, somewhere there in your heart of hearts, you have an intruder. That intruder is fear. If you let it stay, it will keep your best-self trapped and hold your destiny hostage. I think it’s about time you break up with your fears so you can get on with your life, don’t you? So, here’s what we’re going to do. 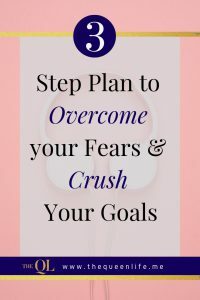 These 3 steps will help you overcome fear so you can crush your goals. Queen, it’s time to have a real, honest, talk with yourself. Be vulnerable with yourself and think about what’s really holding you back. Is it a fear of putting yourself out there because of possible rejection or failure? Are you afraid of actually succeeding and the weight that comes with that? Are you nervous about having to stand on your own without being able to hide behind someone else’s shadow? Whatever it is, take the time to identify it. Keep asking yourself questions about why you feel the way you feel. Eventually you’ll get to the bottom of the specific fears that have been holding you back. When I did this exercise, I realized that I didn’t think I was smart enough to succeed outside of a regular 9-5 job. I was afraid that if I put myself out there people would see through me and think that I had nothing to offer. That terrified me. Facing that fear meant that I had to choose to replace that negative belief about myself with positive beliefs. This process isn’t easy. It can be painful and stressful, so please be patient and kind to yourself, and most importantly, be willing to forgive both yourself and others. It may take you a few hours or a few days to do this, but as you keep at it, you’re bound to discover truths about yourself that will help you move forward. If you want to overcome fear, plan for the worst. So much fear comes from what’s unknown. By thinking of the worst and planning for how you’d recover, you’ll find that suddenly going after what you want isn’t too scary. My worst case scenario: I would run out of my savings and be poor. My game plan: So, I came up with a plan and set a financial benchmark for myself – If my savings fell below $10,000, I’d get a part-time job to make money while I worked on my business. With this plan in place, I felt much better about handing in my 2 weeks notice. For the record, my worst case scenario actually did happen. I had several challenges with starting my business and at the same time my expenses piled up and my savings ran low. So, I found a part-time job on Craigslist. I spent my mornings at the part-time job and my afternoons and evenings working on my business. 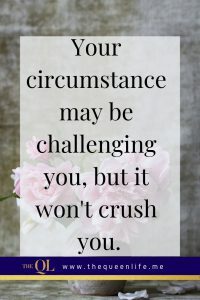 That experience challenged me, but it didn’t crush me. In fact, I discovered that I was a lot tougher than I thought I was. I can guarantee that you are a lot tougher than you think you are. Now that you’ve planned for the worst, it’s time to plan for the best. Set smaller goals for yourself. 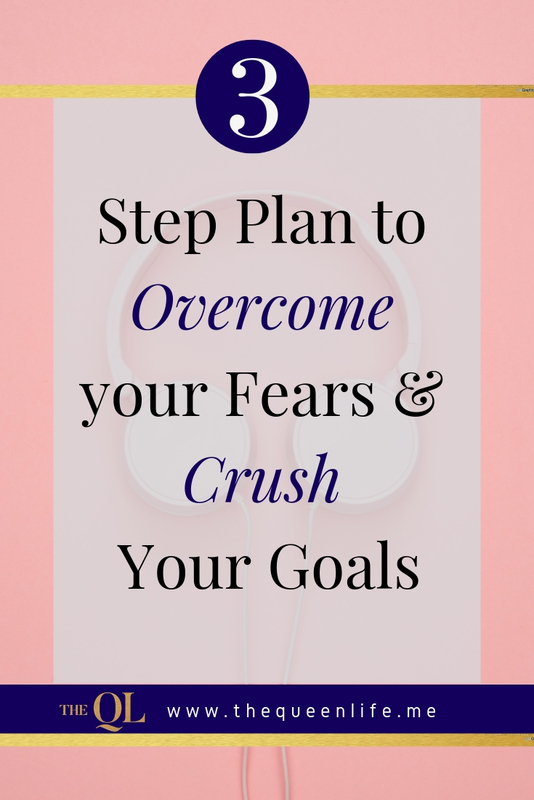 Smaller goals move you toward your dream, build your confidence, and reduce your overwhelm. For example, I knew I wanted to be an entrepreneur, but like many people I was stuck in a 9-5 that I hated. I didn’t know exactly what type of business I wanted to start and I wasn’t quite convinced that I could start a business and make money by myself. That was the first thing I needed to prove to myself. So before I quit my job, I started a test-business making t-shirts on the weekend. I bought a heat press, blank t-shirts, and made custom shirts at local sporting events. I knew I didn’t want to be in the t-shirt business, but because it was a simple business, I was able to start it quickly and test drive being an entrepreneur. After doing my first event and making that first sale, I knew entrepreneurship was for me. I set a new goal to discover my passion and turn it into a business. After I did that, my next goal was to test my business idea on 10 people. I continued the process of making and crushing mini-goals. Start creating mini-goals for yourself and watch your vision come to life before your eyes. The bottom line is this. You have one life to live. There’s no dress rehearsal, there’s just now. You’re either going to be fearful or you’re going to be free. I’m challenging you to choose freedom. You owe it to yourself. The rest of the world is waiting to see what you will create. Go out there, face your fears, and crush your goals. What’s your favorite fear-busting strategy? Sound off in the comments below and let us know.